I've been sculpting like crazy to try and finish up some projects. 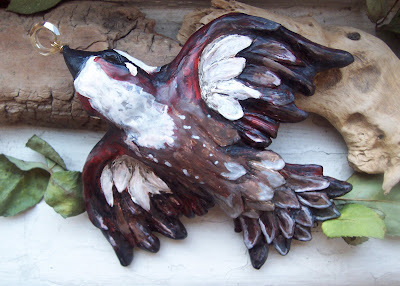 One of them is of a house sparrow that will eventually be crystal encrusted. Above is the sculptural jewelry component in progress. I had just laid down the under-paint for the patterning of the bird with Swarovski crystal flatbacks later on. Below is a music video featuring a Neko Case song called, "Maybe Sparrow." 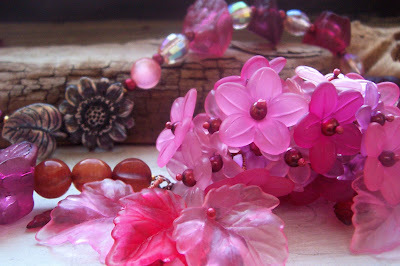 Here's a quick shot of some of my opalescent glass bead stash. I wasn't kidding when I said I had a small dragon's hoard worth! 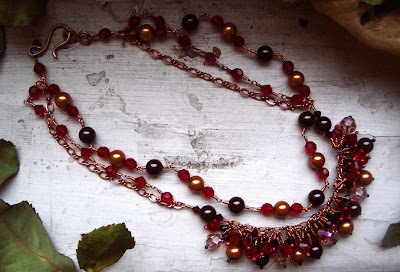 I had the intentions of creating a kit or a necklace series, but life caught me up and refused to let me go. 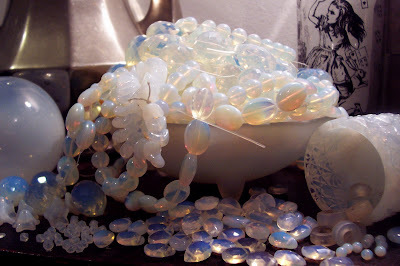 The picture of the beads was taken with my milk glass orb, my Hudson Beach Glass nesting bowl, my Alice in Wonderland drinking glass, my opalescent glass salt bowl, and my mercury glass tea kettle. 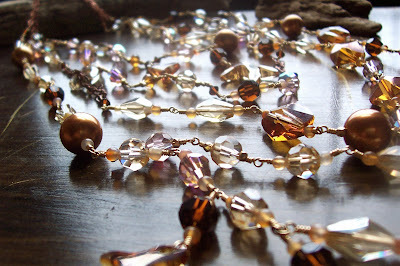 I love materials that capture and reflect light! I have tons of opalescent glass. I love the way it captures light, shimmering like a small flame is locked within yet remains seemingly cool. It is a contrast that I find very appealing. Hundreds of impulse buys later, I have bags and bags of various strands of opalescent glass beads in different sizes and shapes. 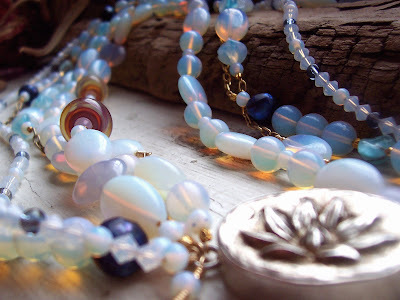 This piece that I've titled, Serenity's Garden, is an attempt to hone the magic of the glass and create a multi-stranded choker that really spotlights the material. 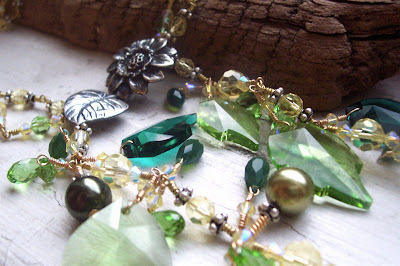 To accentuate the opalescent glass, I've used a Green Girl Studios lotus box clasp, borosilicate rondelles from Family Glass, and pearls and vintage German glass from Talisman Associates. 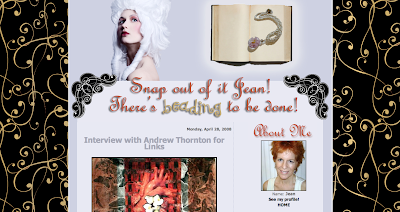 The delightful, Jean Yates author of Links: Inspired Bead and Wire Jewelry Creations, interviewed me about my creative process for her blog. 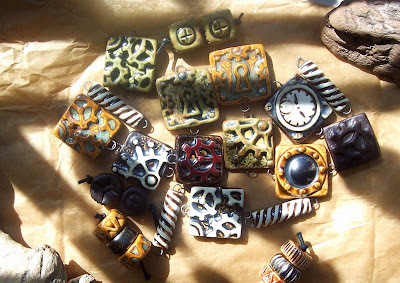 She's been doing a series of interviews with artists and bead-makers since the release of her book. This week was my turn. Check it out by CLICKING HERE or visiting her Amazon blog by CLICKING HERE. Here's a new piece that I've whipped up. I call it, "The Time Traveler's Wife." It was named after the book by Audrey Niffenegger with the same title . I think it came out very Steampunk, blending a lot of modern elements with romantic vintage components like the old brass key, filigree from Vintaj, and vintage German glass from Talisman Associates. I think the piece looks better worn, as all the counter-balances make everything hang nicely. Here's a new piece that I've been working on. I call it, Nouveau Royale. I've been working in the studio like mad trying to finish everything up. I am one of those people who is very ambitious and will often times bite off more than they can chew as far as their designs and projects go. And since I don't like to cut corners and I like to spend time pouring myself into projects, it is often at the detriment of my creature comforts (namely sleep). Thusly, I kind of feel yucky today. I had high ambitions of running around and poking about various shops, scooting about green markets, traipsing through flower-laden park paths and going to different parties, but I'm worn out and still have a lot to do still yet. I think I'll call it an early night tonight and catch up on some much needed rest. I've been meaning to post this picture of my new Anne Choi bead. The crying flying-heart is the latest addition to my dragon's hoard. Isn't it just wonderful? I love it! 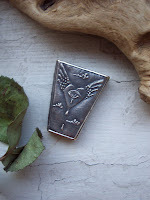 Green Girl Studios, my family's company, makes lots of flying-heart motif pieces like THIS ONE, THIS ONE, and THIS ONE. Perhaps I'll use a combination of them for the finished design? For the past few days, they've been doing work on the internet connection on my block. To insure that they are not disturbing as many customers as possible, they've restricted their repairs to the wee hours of the morning. However, due to the fact that I'm at work for a good majority of the day and early evening, the only time I have to update my blog is in the wee hours of the morning. And thus, I have explained the reasoning behind why there's been a relative radio silence. For that, I apologize. Anyway, I've got to get back to work. If I ever dream of finishing up, I will have to. 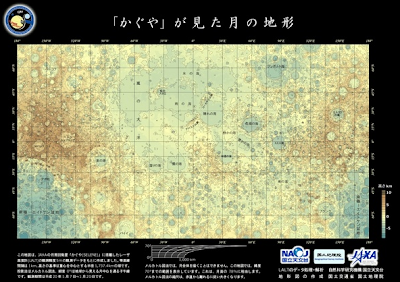 Japan's lunar spacecraft, Kaguya (or the Westernized Selene), has just finished sending back high definition maps of the surface of the moon. The maps are compiled of over six million 3D data points collected from a laser altimeter. Meanwhile... 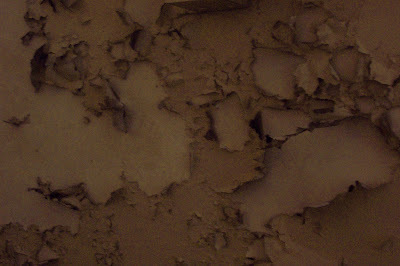 I've been taking pictures of the ceilings of subway stations. I love the textures and how much it reminds me of the moon. I should be worried that I'm breathing in lead paint or that I'll get a piece in my eye, but instead I'm enjoying the view of a thing in slow decay. I just discovered that Zoa Art's blog moved to HERE. Apparently their blog moved ages ago! On their old blog, you'll see all sorts of comments from me about how they must update their blog more. All the while, they were posting away on the new one. I am happy to be reconnected! 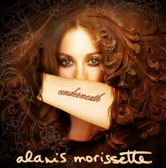 The first track from Alanis Morissette's latest album soon to debut, Flavors of Entanglement, has been released. The song is titled, "Underneath." Despite the social pressures from many of my peers not to like her, I still enjoy her work. In celebration of the new release, I offer the video below. If you haven't seen it, you simply must! While running errands and doing mountains of laundry, fortune smiled hard upon me. 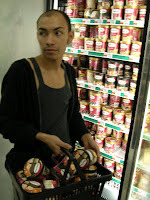 I discovered in the market a new shipment of my favorite ice cream! 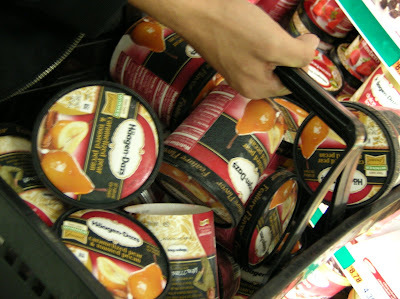 Häagen Dazs came out with a limited edition flavor, Caramelized Pear and Toasted Pecans, and I'm absolutely hooked on it. The only problem is that it is nearly impossible to find. So, naturally, like the hoarder I am, I bought every single container. For the past few years, I've lived in the same neighborhood in Brooklyn. The face of East Williamsburg is changing. But all through the building of luxury condos and importation of gourmet cookies and fancy beers, a little old man has been weeding his garden. It's not a substantial piece of land. In fact, it's a small side-yard to one of the brownstones in the neighborhood. Even so, I've seen him over the years lovingly weed his garden on a near daily basis. Lately though, I haven't seen him out. The weather has been so nice and the flowers are beginning to bloom. Normally this time of year he is in his element tending the flowers and seeing that everything is taken care of. But this year, I haven't seen him. 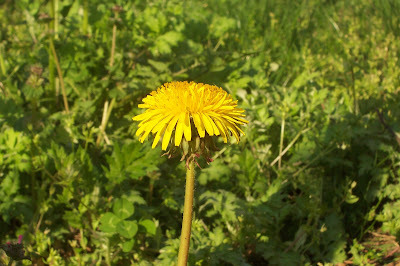 Instead I've seen numerous dandelions springing up in his beloved plot of land and just today a "For Sale" sign in the front window. After a day of exploring, the evening ends with dinner and some work. I'm finishing up some projects over a meatloaf. I was experimental and added bison meat. I'll post pictures of what I've been working on when more is complete. This might not seem like anything extraordinary, but I am always struck by the display windows in local bodegas. Everything is in a row or stacked very neatly. Sometimes, like in the grocery stores like C-Town, they stack the canned goods in giant castles. (Those always seemed precarious to say the least and I would be filled with a sense of unease while walking down the aisles with a seed of worry in my heart that should someone knock into the carefully stacked pyramids, I might be buried alive -or dead- under a tidal-wave of non-perishables.) 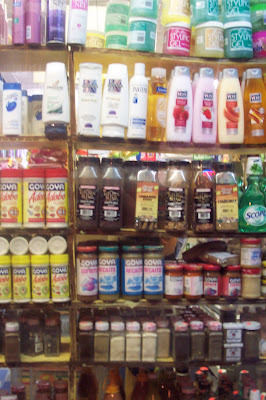 In the more subdue corner deli shops, there is an intriguing pattern created in the everyday items of soaps, spices, shampoos, and various condiments. When I have a few hours of free time, I am on a determined mission to explore my beloved Brooklyn. I feel that far too often the little treasures of pocket communities are ignored. Thusly, it was exploration time. The destination on this particular mini-adventure: Sunset Park. I've come across some places that have names that just strike me as being completely ironic. For instance, "Winter Garden" in Florida . 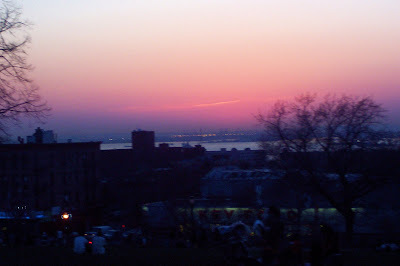 But I found that Sunset Park (the park and not the entire neighborhood) was aptly named. It's one of the higher points in Brooklyn and has a lovely Western view of Manhattan and the westward lowlands (that is if you ignore the very prominent Key Foods). 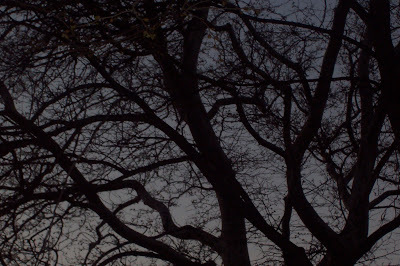 In winter the barren trees shall be a black writing but they shall not understand it." Above is another view from Sunset Park. 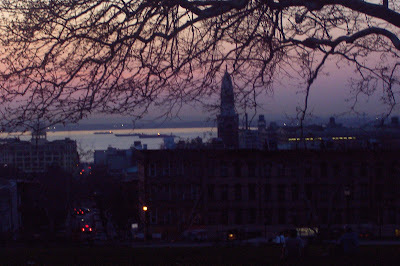 From the hilltop, one can see the Statue of Liberty, the skyline of New York, the Staten Island Ferries going to and fro and the twinkling lights of Jersey City across the way. It really is a lovely place to visit... especially at the time of day it is named for. The black space below is actually a video! I was on the train crossing over the bridge near sunset when this short video was taken. The pylons and suspensions of the bridge in combination with the motion of the train gave it a shutter-box or zoetrope effect. As I mentioned in another post, I've been thinking about the quality of light a lot lately. I've been trying to curb my bibliophilia. I know, sounds crazy. Why would anyone want to do that? But I came to realize that I only wanted the books to want them and to get them to have them. I would buy stacks and stacks of books, pile them up and never look at them again. I have countless tales untold still waiting for me to crack them open and delve into their pages. HOWEVER, I saw these two new books and had to acquire them! 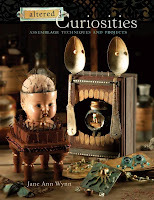 I've been dying to get Jane Ann Wynn's book, Altered Curiosities, since before it came out and Cynthia recommended Stephanie Lee's book, Semiprecious Salvage. So, I've made a pact with myself: Read no other book until these two are finished. Buy no other book until these two are finished. Perhaps... or I could stop in at Strand after work tomorrow to see what new art books they have. 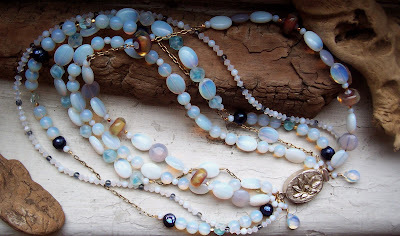 I think that since I've been working with crystals so much lately, I've become sensitive to various qualities of light. Maybe that's just wishful thinking or code that I've been spending far too much time indoors with all this nice weather. Whatever it is, I've started to notice things such as how the light pours through and plays in an old glass honey jar, now used to hold flowers in a state of decay. I can't get enough of Spring right now! It really is very nice out. Luckily I've been getting out of work earlier than usual, which affords me the opportunity to enjoy the weather out more than I usually would. 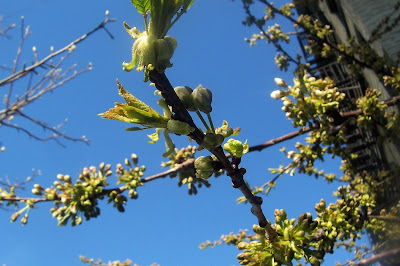 Above is a shot of the cherry tree outside my apartment building in the little community garden. I know I should have been getting work done, but instead I opted to bake a spicy carrot cake with a butter cream cheese frosting. I flavour mine with ancho and chipotle chilies and sprinkle in black sesames. Here's a quick little shot I took outside Grace Church. The weather has been improving nicely, and after a long winter, scenes of beauteous spring are utterly disarming. Jamie Hogsett (author of several books, including Stringing Style and Create Jewelry: Pearls) and her mother came to New York to celebrate Jamie's birthday. Amidst their busy schedule of seeing museums and Broadway shows, I was very lucky to have them squeeze me in for a little time to chat and catch up. I haven't seen Jamie since Tucson, where she got horribly sick with the flu and wasn't able to hangout much. It was wonderful seeing her today! It was an especially nice visit, as she brought me a great little gift that she made. Isn't it just delightful? I love the beaded owl that she made for me. It'll go nicely in my curio case. 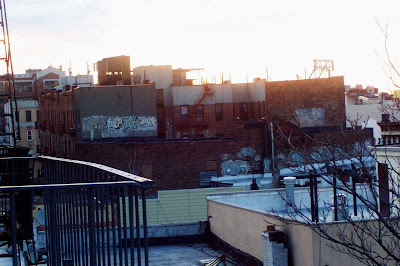 This is a photo out my kitchen window looking out onto my Brooklyn vista. I'm not by any stretch of the imagination a morning person, but I love Sunday mornings for some reason. They are so quiet and are decidedly my own. Before work, I brew a strong cup of tea (lapsang souchong this particular morning) and sit and look out the window. I look out at the house sparrows, the purple martins, the starlings, the seagulls, the pigeons, the turtledoves, the chickadees, and the larks. It's surprising how many different birds there are here. I watch all the birds going about their daily activities - building nests, swimming on the air, flitting over crumbs and worms. This quiet meditation, spent watching the wildlife in a metropolitan area is one of my favorite things. So, it's just before bed-time and I wanted to post another flower picture before dosing off. I took this picture on the way to the train station on my way home. It was dark and cool outside, and slightly misty. The moon was out and the street was quiet. It was a perfect spring evening - one laden with flower blossoms on the blooming trees. It was the perfect image to hold in my head as I traversed the subway system. Kathy Callahan and I met up for some coffee and a trip to the Whitney to see the Biennial. I had imagined that it'd be busier, as it was the pay what you wish night, but was surprised how empty it was. This feeling would carry through throughout the evening. Don't get me wrong, there were really interesting pieces like the Phoebe Washburn installation, but for the most part I was left with the sense that things were incomplete, in transit, unfinished, and not thoroughly thought through. In my opinion, if something is not highly intellectual and thought-provoking, it should at least look good and give a gee-whiz saccharine satisfaction. I guess I expect a lot from survey shows that are supposed to culminate the gestalt of contemporary art. Many of the pieces on display seemed to be evidence of Art or shadows of ideas not yet fully realized. After spending a grey winter in the City, it is so refreshing to see little bits of color pop up. Above are just two little snap-shot examples of such color; the one on the left is a tulip tree and the one on the right are some daffodils. Needless to say, these are probably just the first of the pictures I'll be taking around town of the flora springing up. Here's a little sneak peak at some of the secret projects that I've been working on. I can't really show images of the full pieces in their entirety, but figured I could share a couple of artsy close-ups. 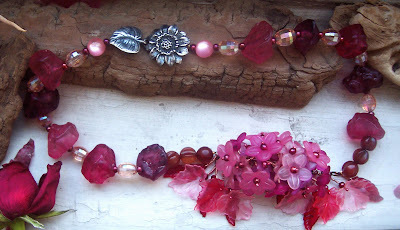 As you can tell from the photos, I've been wire-wrapping my little fingers to the bones. 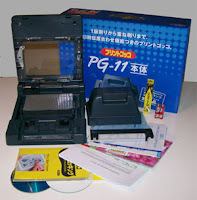 Seems like I've been saving for this forever, but I now have my Print Gocco kit! FINALLY! (They don't make them anymore and can get pricey.) I am so excited to crank out some prints. I love the graphicness of silkscreens, but was horrible at it in school. This seems like a happy medium, that with practice, I can conquer with success! Even when the world seems to be spinning madly on, I think it's important to stop sometimes and enjoy a home-cooked meal. It doesn't have to be anything fancy - just something you make in your kitchen for yourself and those you love. It really is food for the soul. Left: Dinner at my house; a blend of roasted red peppers, shiitake mushrooms, caramelized onions, garlic, and duck fat over sticky rice. This is a photo of a window display that features artwork that I pass daily on East 10th Street and Broadway here in New York. 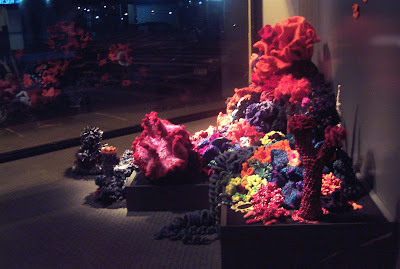 The soft sculpture is a sampling from the show Hyperbolic Crochet Coral Reef. Apparently these pieces were created as a reaction to global warming and the accelerated destruction of the world's coral reefs. CLICK HERE to learn more about it. CLICK HERE for the New York Times article. Here are a few photos taken this morning while working on some projects. Sometimes when you're hands are all gnarled with repetition and your eyes are burning from supreme focus, it is good to step back from your work and enjoy the everyday pleasures that surround you. Roses in the honey jar on the windowsill. The company of the lovely turtledove named, "Pom Pom." 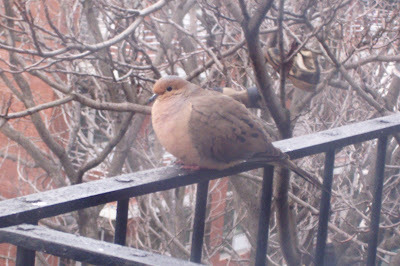 She sings the sweetest songs in the morning on my "New York balcony" a.k.a. my fire-escape. 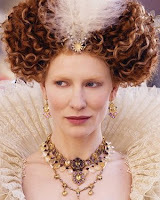 These past few nights have been late ones spent in the company of Cate Blanchett as Queen Elizabeth. I've had the movies going in the background while I've been busily working away. My studio is making great strides to finally becoming functional. I hanged the track-lighting and hauled off four giant bags of trash, as well as went through almost all of the dozens of boxes hidden about. This was not easy for me, a confessed hoarder. To the ordinary passerby, it'd look like a complete disaster zone, but I see the seed of promise lurking in the piles and stacks. 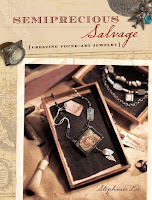 When I've not been working on organizing, I've been designing jewelry feverishly. I've finished several rather "over-the-top" pieces, but must wait before I can share them. A couple thousand crystals arrived in the mail today, so I will be very busy in the next few weeks. I've also finished up the backgrounds for about a hundred collages. I have a callous from the scissors. The first pair of scissors did not make it. The handles broke under all the excessive pressures of cutting. And betwixt all this, I managed to squeeze in finishing reading the last A Series of Unfortunate Events book by Lemony Snicket called, "The End." It was good to complete the circle and tie up a good many loose ends, even though the book really makes a point of expressing how it is only a small segment of several lives partially revealed and only actually concludes a handful of tales. I'm wearing myself out pretty good, but I think all the multiple tasks and projects and distractions have been good for me. I kind of feel like a bee, going from flower to flower. Anyway, it is back to Elizabethan England. Above Left: The Owl Keeper from Catanzaro by Nadia Turner. Above Right: My sister, Cynthia, holding Arata at Bead & Button show last year. As I said I would, I was scrolling back through the archives of the Journal of Mythic Arts when I came across a post featuring the work of Nadia Turner. I was kind of stunned at how much it looked like my sister Cynthia. Of course I couldn't find the picture that I wanted to compare and contrast with the painting, but this is a shot taken last year is close enough. Turner is from Australia and from what I know, I don't think my sister has ever been there. Weird, eh?